Having locale LC_NUMERIC=it_IT.UTF-8 gnome-calculator get the dot only in 1st position, then after 1st position pressing numeric keypad delete does nothing and i have to press num lock to have the comma i need because my locale. Having locale LC_NUMERIC=it_IT.UTF-8 gnome-calculator should interpret the numeric keypad delete/dot as a comma according locale. 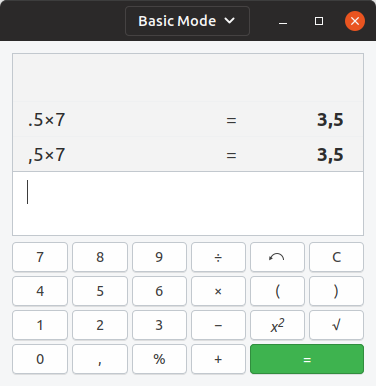 I open gnome-calculator in basic mode. Remember: I have locale LC_NUMERIC=it_IT.UTF-8 where decimal separator is comma. I perform all following operations using the numeric keypad. in other words the canc/dot key act as 'dot' only in 1st position. if i hit the num lock key the num-lock LED lights up and pressing the canc/dot key i see a comma.